From the latest must-have ingredient, to taste-expanding fusions, to unexpected shortages caused by climate change, food is constantly finding its way into the consciousness of Canadians. It’s in our news feeds, on our TVs, and more and more, a part of our day-to-day conversations. But how do we separate the truth from the lies, the ephemeral from the soon-to-be-everyday, the next charcoal fad from the rise of the avocado? We’ve looked into our culinary crystal ball and identified the six key trends that will be on the menu for 2019. Authored by Michael von Massow, Alfons Weersink, Aaron De Laporte, Liam Kelly. In partnership with the University of Guelph Department of Food, Agriculture and Resource Economics. You can download the Food Focus Report (PDF, 4MB) or read it in its entirety below. Our tastes in food are changing. 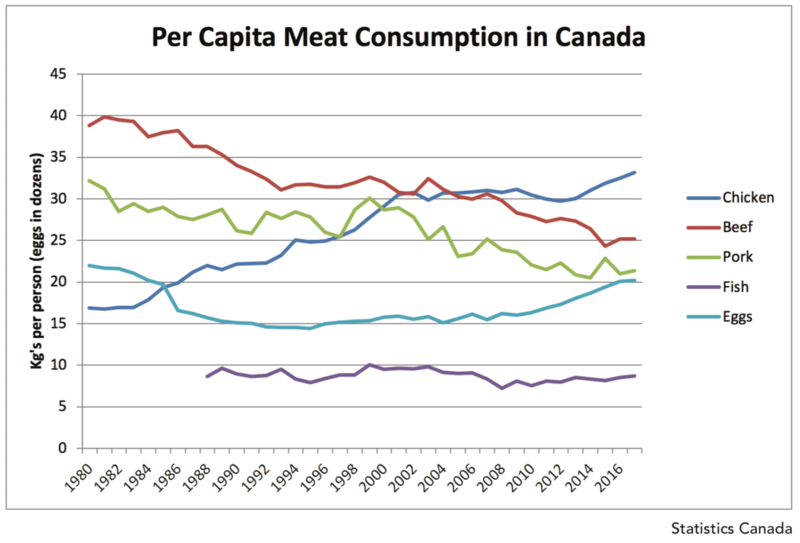 One of the most profound changes is the decrease in meat consumption in Canada. This change is driven less by an increase in vegetarianism or veganism and more by a general move by Canadians to reduce meat consumption. This ongoing trend is reinforced by the new Canada Food Guide released in early 2019. Red meat consumption has fallen consistently over the past 40 years.i And while both pork and beef per capita consumption have flattened in the past four or five years, there is a general expectation that a downward trend will continue. This has been offset by an increase in chicken consumption. Fish has been relatively flat over the time period for which data exists, but like chicken, this will likely increase in the coming years as a replacement for red meat. In the 1990’s and early 2000’s, eggs decreased dramatically due to cholesterol concerns, but consumption has recovered as fears have been allayed. Flexitarians, those who choose to eat less meat, represent a significant proportion of the Canadian public. A recent survey undertaken by the University of Guelph suggests that almost 85% of Canadians are eating at least one main meal per month without animal protein and almost 50% say that they eat one main meal per week without animal protein. In addition to fewer meals without animal protein,ii we also see an aging population consuming smaller protein serving sizes when they do eat meat. Roughly 5% of Canadians consider themselves vegetarian, while close to 3% of Canadians consider themselves vegan. Females were much more likely to be vegetarian and somewhat more likely to be vegan. Younger consumers were more likely to be vegetarian or vegan compared to older ones. The growing awareness of these trends is important, not only because of Canadians who consider themselves vegetarians or vegans, but also because close to 50% of Canadians who do eat animal protein stated that they eat at least one main meal a week without animal protein, and 85% suggest they eat at least one non-animal protein main meal per month. That means that almost 85% of Canadians are trying to eat less meat. The ‘flexitarian’ phenomenon may have more impact on long term meat demand than vegetarian or vegan behaviour. The large portion of non-vegetarians/vegans who will eat main meals without animal protein are indicative of a growing trend towards ‘flexitarians’ or ‘meat minimalists’ – individuals who tend to eat less meat and different kinds of meat. There are several reasons for this reduction. There is concern relative to the health impacts particularly of red meat consumption. There are also concerns with respect to the environmental impact of meat production and animal welfare. As we reduce our meat consumption, the relative demand for different cuts of meat changes. Consumers are much more likely to maintain the higher-end consumption (i.e. steak as a treat versus ground beef). As these are produced in relatively fixed proportions in animal production, we could see an increased spread between the top and bottom end of the price spectrum. The type of products consumed will also differ between vegetarians/vegans and flexitarians. 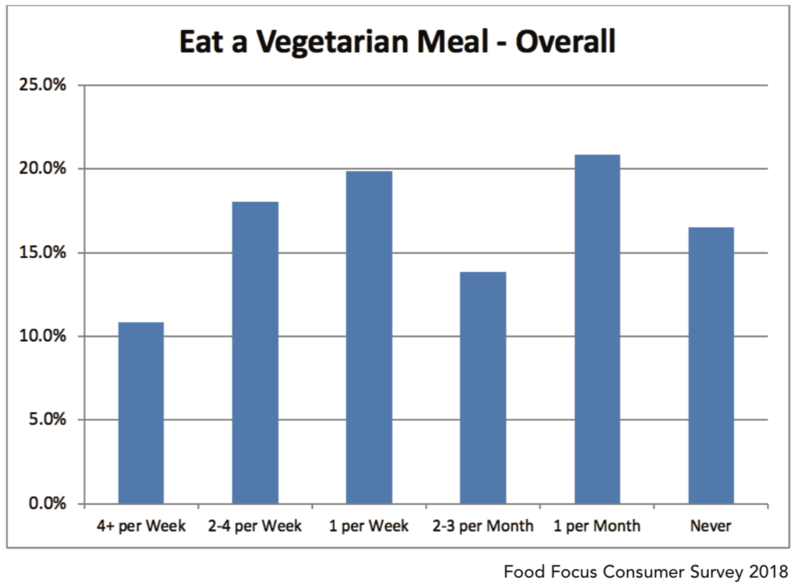 Flexitarians are much more likely to want meat analogs that mirror their taste and texture experience with real meat. Regardless, the demand for plant and insect-based proteins will grow for flexitarians. Vegans and vegetarians are more likely to consider insect protein to be ‘meat’ and not consume it. This decrease in demand is unlikely to push overall meat prices down in Canadian retail and food service, as world demand for meat continues to increase and Canada exports meat. Canadian access to international markets is actually improving with new trade agreements (particularly the Trans-Pacific Partnership) so there will continue to be competition and markets for Canadian production. Generally, many consumers have heard of gene editing and CRISPR technology specifically. At the end of 2018, there were reports of gene edited babies from a doctor in China. Many scientists are vehemently opposed to the application of this technology in humans due to ethical and other concerns. As there are likely to be gene edited food products available in the near future, this debate is sure to enter into the larger food conversation. Gene editing is the latest technology focused on modifying the DNA of a species that offers the potential for large improvements in human, animal, and environmental health. The benefits could be particularly great for the world’s poorest – Bill Gates claims gene editing can help lift millions out of poverty through reducing food insecurity and human health challenges.iii Ethical and regulatory concerns, however, may prevent its potential from being reached. With all these potential benefits, what is holding us back from a full-on embrace of gene editing? For many, it relates to the morality of working with genetic codes.xiii Particularly in the human context, many individuals feel instinctual fear associated with the concept of altering humanity. Introducing designer babies and eugenics to any conversation has the Hitler effect – all conversation immediately stops. While the science is different in many ways from genetic engineering (in which genes are sometimes transferred between species), this distinction is not always clear in the minds of consumers. While for many the discomfort relative to genetic modification seems to be waning, this discomfort is still easily transferred to gene editing. However, from an agricultural perspective, crops and livestock are very different from humans. Gene editing is a natural extension of traditional breeding – but much faster, much more specific, and potentially cheaper. Gene editing is not genetic modification (GM) in which a sequence of DNA from one species is inserted into another. There are no unnatural crossbreeds in gene editing. Yet the full use of gene editing depends on whether it is able to garner wide-scale political and consumer support, which GM technology has been unable to do. Proponents of gene editing hope the public will be willing to accept potential risks because these will be outweighed by the benefits accruing to many in society. In contrast, the lack of broad support for GM technology has been partially attributed to the initial applications of GM technology being focused largely on farmers, so the general public bore the perceived risks with little personal gain. The challenges related to acceptance of gene editing are highlighted by the European Union’s recent decision to treat gene edited products the same as genetically modified products.xiv Most scientists involved in gene editing feel this decision is almost farcical. The significant social engagement hurdle created by our instinctual fear of ‘unnatural’ products, particularly their potential unknown long-term effects, leaves gene editing in a curious position – a potential saviour with a lot of work left to do. The governance and ethical issues surrounding gene editing is typical of other technologies being developed for the agri-food sector. The challenge is to communicate the trade-offs with gene editing, which differ between plants and humans, to a public that is further removed from the farm and with a science that is difficult to articulate. The effectiveness of this communication will be the critical factor in achieving the potential benefits associated with this technology. Bees and other pollinators are critical for the production of many crops and also play a vital role in sustaining many ecosystems. The decline of bee populations and the protection of pollinators has been in the news and will continue to be front and centre in the food conversation. We will see public and private efforts to protect pollinators – including everything from the establishment of bee hotels to monitor their health to further restrictions on agricultural pesticides. There are trade-offs in any effort to enhance pollinator numbers and the complexity of the issues and relationships between farming practices and ecological diversity are representative of a number of other situations where agriculture, the environment and food are intertwined. Interest in pollinators was piqued a decade ago with the spread of Colony Collapse Disorder (CCD), a term given to describe the significant increase in mortality rates of bee colonies. While wintering, losses up to one-quarter of a colony in Canada are normal, the large increase in losses confounded experts. Possible reasons for CCD include particularly harsh winters, infections from mites, the loss of native and non-native flowering habitat, and pesticides. Modern agriculture is associated with the latter two factors; the increase in certain crops, such as canola, corn and soybeans, has reduced bee-friendly habitat and problematic pesticides are used on these crops. Farming and pollinators thus have a complex relationship to be balanced – pollinators are necessary for the development of some crops, but the production of other crops and the control of pests affecting those crops are associated with the decline of pollinators. The complexity results in significant trade-offs associated with any policy response to increase pollinator numbers, as demonstrated by the debate surrounding neonicotinoids, or neonics for short. Neonics are an insecticide typically applied to the seed coat that can protect the plant if there is a pest problem. Approved for farm use since the 1990s, neonics are estimated to provide benefits of 2% to 3% of the farm gate value of corn and soybeans in Canada. Agricultural groups argue neonic levels used in the field are well below the rates deemed to be safe for pollinators, but the Task Force of Systemic Pesticides has concluded that neonics are a major reason behind the decline in pollinators. The policy response varies depending on the locality. The European Union will be implementing a total ban on neonics, except within greenhouses, by the end of the year, and several Canadian cities, including Montreal and Vancouver, have imposed a similar ban. Canada has a proposal to phase out several neonics over a five-year period and Ontario farmers can only buy certain types of neonics from registered vendors, and only if a pest problem exists. Opponents of the ban claim that the alternatives to neonics are more harmful and less effective. Recent research supports the assertion that the current chemical alternative, sulfoximine-based insecticides, is more harmful to pollinators and other organisms. The desire to protect pollinators has resulted in a number of local efforts, including the planting of gardens within pollinator friendly cities. These kinds of efforts have relatively small costs, but large-scale public efforts can impose significant costs onto farmers by changing their available options, often with uncertain benefits. The imposition of the bans is representative of similar constraints on farming practices. Public sentiment for pollinators has heightened interest in the interactions between bees and agriculture, and is indicative of the growing concern about other off-farm impacts associated with modern agriculture. Striking the right balance will be critical as we move forward. Trade has been at the forefront of discussions of the Canadian economy – from interprovincial trade barriers, to a renegotiated NAFTA/USMCA, to new trade agreements with Europe and the Pacific Rim. Trade in food has provided Canadian farmers with access to markets hungry for our products and has also provided Canadian consumers with a wider range of affordable food products. Fundamentally, food trade has been good for Canada. Despite recent worry about new deals – particularly USMCA – the impact on Canadian food consumers is likely to be relatively small. While the negotiation and completion of the USMCA garnered significant attention, the scope of the new impacts on the food system is relatively limited, with the dairy, chicken and other supply-managed sectors taking the brunt. There was a collective sigh of relief in the broader agri-food sector that a deal got done and that there was no change in the rules governing trade in most food products. Predictability is important, and the food systems are almost as integrated as the automotive sectors, with products like beef and pork (among many others) flowing in both directions. The fact that there were no changes under the new deal was important for both consumers and producers. The biggest impact of the new agreement is in the dairy sector. There are two elements here. The first is that the agreement allows for increased market access (approximately 3.6% in dairy) for US product into Canada. President Trump frequently raised Canada’s high tariffs on dairy as unacceptable and this additional access provides an avenue for product to come into Canada at significantly lower tariff levels. The US has historically had some access to Canada’s dairy market at lower tariff levels and this new allowance provides for a larger volume. The 3.6% amount does not sound large, but needs to be considered in the context of both previous concessions and the structure of the dairy market. When concessions under CETA (the trade deal with Europe) and the renegotiated TPP without the US are taken into consideration, Canada has ceded approximately 10% of its dairy market in the past couple of years. A small increase in access might cause pain and disruption in the market, but could be buffered by market growth. Ceding access in the range of 10% means there will be decreases for Canadian producers and processors which will hurt as overhead costs remain the same while volumes are lower. There is very little trade in fluid milk – it is perishable and expensive to ship as it has a high volume of water. Cheese and other processed products are more frequently traded, so the access will put disproportionate pressure on those processors. Additional access was also provided in chicken and the other supply-managed commodities. The second element, which is unique to dairy, is Classes 6 and 7. Milk and its components are priced by end use and these classes were recently introduced to allow Canadian milk protein to compete with that from the US (known as diafiltered milk). Canada committed to doing away with these classes and pricing these components ‘appropriately.’ The agreement provides a price floor based on a formula built on the US price. While there is also an export cap, some argue that the discussion of exports provides Canada with the opportunity to sell ‘appropriately’ priced milk protein if US product re-enters the market. The implications for Canada depend on the price and the volume of both US imports and Canadian exports. There is likely to be at least some US product which will put additional pressure on the Canadian producers as the market for Canadian milk components shrinks. However, the pain in the dairy production and processing sector is unlikely to lead to cheaper products for Canadian consumers. Dairy products are often loss leaders in food retail and retailers may choose to keep some of the margin for themselves. It is also not clear that those companies who are allocated quotas (the way access is provided) have a motivation to undercut the market. They cannot sell more than they are allocated so there is no incentive to price cheaper. Canadian consumers may see more variety of cheeses and other dairy products in store, but are unlikely to see cheaper prices. The new CPTPP has provisions for increased access or reduced tariffs into many Asian markets which becomes an opportunity for many Canadian products. This has been a fundamental objective going into both the Trans-Pacific Partnership and the European trade deal (CETA). Establishing stable markets for Canadian products helps farmers, food processors, transportation, rural communities, and others to thrive and grow while creating jobs and economic activity in Canada. Many observers had expected the completion of the USMCA would lead to the removal of the steel and aluminum tariffs imposed by the Trump administration. This in turn would have led to the removal of the tariffs that Canada imposed in response. This has not happened yet and does not seem imminent. While Canada’s retaliatory tariffs were strategic and focused, they likely led to increased prices for some products in Canadian stores. The higher priced products should all have viable substitutes, so the net impact on Canadian consumers is moderate. Removal of the tariffs, as a result of a completed renegotiation, should see prices of select products come down. While there will be pain in dairy and other supply managed commodities without significant benefits for Canadian consumers, overall trade will be good for Canada. Increasing food prices are frequently in the news and are often cause for unneeded anxiety in Canadians. The truth is, that while there is variability from year to year, food price increases have been relatively consistent over the years. There is considerable variability within years that makes it seem like prices are increasing more quickly than they actually are. We often hear about extreme price swings in agricultural commodities such as corn, wheat or soybeans. In 2018, this was driven in part by the Trump administration’s trade battle with China. Consumers are, to a degree, protected from these extreme swings as the prices of these basic commodities often make up a very small portion of the retail cost of a product. Farm and food prices are not the same, and their relationship is weakening over time – at least for Canadian consumers. Agricultural commodity prices have reverted from their record high levels between 2008 to 2014 to levels that prompted farm protests in the early part of this century. The agricultural outlook from the OECD projects real agricultural prices to be flat over the next couple of years and U.S. net farm income for this year is estimated to be half of the recent record levels. Canadian farm income is forecasted to drop this year but has been supported by high yields and the low Canadian dollar. Storm clouds, however, are appearing on the horizon for Canadian farmers. The reversion of prices back to the historical downward trend supports the old adage that the cure for high prices is high prices. Farmers responded to the increase in net returns by producing more, but now demand has flattened. Whether this is a continuation of a historical decline in prices or a temporary reversal in which the future looks bright for the agricultural sector, the current price drop has implications for the agri-food sector. The projected decline in farm returns and the potential for interest rate hikes will increase financial pressures for farmers, particularly those with high debt loads. Spending will be cut, and this could soften the outlook for farm-related businesses, such as farm machinery dealerships. The multiplier effects of the decline in spending will be felt by rural communities, whose economies are reliant on agriculture and its input supply sector. Provincial and federal governments that are revamping income support policies will also face greater payouts to farmers from these programs as farm returns drop below support levels. Many of us will not notice the lower farm prices, in the same way we did not notice the boom in prices a decade ago. The farmers’ share of the food dollar is around 20% – it is higher for less processed foods (near 50% for eggs), and lower for more processed foods (2% for corn, which is used as a sweetener). As a result, price changes for commodities like corn or soybeans have relatively little impact on retail prices. The farmer share will continue to fall as consumers eat out more often rather than preparing food at home. Grocers were hesitant to change food prices during the boom in agricultural commodity prices and are similarly reluctant to adjust them downward now as prices fall. This is partially due to the small component that raw farm goods tend to comprise of the total cost of grocery items, but it’s also due to competitive pressures among the major retailers and the desire to maintain market share. Grocery margins are small and squeezed when prices go up. Lower prices allow grocers to recover some of the margin lost as prices increased. Forecasts for food prices are close to the rate of inflation, as they have been historically, with minimum wage and fuel price increases as the major reasons for the upward pressure. Tariffs stemming from the trade dispute with the U.S. could also lead to food inflation rates rising above the normal rate. Ironically, the trade war may have been triggered by low milk prices in the U.S. and the call for Canada to open its borders to American dairy products. While the effect of low agricultural commodity prices will be confined to farmers and agriculturally-intensive regions for Canada, there will be impacts across all sectors in developing countries. Consumers in these regions spend a larger portion of their budget on food and these purchases are more likely to be of raw farm goods. As such, a decrease in farm prices translates more directly to decreases in food prices. The beneficiaries here are consumers, while farmers in rural areas are hurt. In contrast, farm households in developing countries profited from the commodity price boom while the losers were poor urban households in major food importing countries. The food riots that captured media attention were concentrated in such countries. The drop in agricultural commodity prices will benefit the urban poor in developing countries, but will have little impact on consumers in countries like Canada where the link between the farm and food price continues to weaken. Canada legalized cannabis use in 2018, but the current legislation does not yet allow for cannabis-infused food and beverage products to be produced or sold (outside of the medical market). The federal government has indicated that edible and drinkable products will be incorporated into Bill C-45 (the Cannabis Act) within one year of legalization. This introduction will provide access for consumers who prefer not to smoke as well as opportunities for food processors and, potentially, for food service. On December 20th, 2018, Health Canada released draft regulations for edible, topical, and concentrated cannabis products.xvii They have indicated that they are continuing their consultation process and these proposed regulations may change. While these regulations are not final, they have provided a degree of certainty to both producers and consumers. A recent report from consulting firm Deloitte has estimated that Canada’s total cannabis market (including illegal and medical sales) will be over $7 billion in 2019.xviii This puts the cannabis market on par with the Canadian wine market ($7 billion in 2016-2017) and slightly below the Canadian beer market ($9 billion in 2016-2017). In the food and beverage industry, opportunities exist for health foods and supplements, snack foods, packaged meals, beverages, restaurants and tourism. Importantly, with the rise in popularity of CBD-based products, there appears to be demand for both intoxicating and non-intoxicating products. Even CBD-based pet products have become an important product segment. In the U.S., states that have legalized recreational cannabis have seen a persistent trend away from cannabis flower and towards cannabis edibles, concentrates, and topicals. In Colorado, Washington and Oregon (three of the first U.S. states to legalize recreational cannabis), concentrates constitute approximately 20% of the market, followed by edibles at 10-15%, with candy and chocolate-based products being the most populariii. In the report from Deloitte, they found that over 58% of current and likely Canadian cannabis users intend to consume edible cannabis products once legalized. While the legalization of cannabis offers a range of opportunities for the food and beverage industry, the market is not without its perils. Cannabis products can be difficult to effectively dose and this can lead to overconsumption. Edibles also create easier access for unintended secondary consumption by children or pets. In 2018, there was a case in Halifax in which a young child consumed a large dose of cannabis in a chocolate edible. Similar to alcohol, the significance of intoxication from cannabis is influenced by a number of factors (i.e. tolerance, recent food consumption, tiredness, etc.). This is especially true for edible products and one of the reasons cited by the federal government for delaying the legalization of edible cannabis products. Getting dosages right and educating consumers on the risks of overconsumption will be an important process over the next year. Another risk with the legal cannabis market is the extent of regulations and legislative requirements that must be met before products can be legally produced or sold. Cannabis products in Canada are regulated by three different pieces of legislation: the Cannabis Act, the Controlled Drugs and Substances Act, and the Food and Drugs Act. In addition, products for medical consumers must also meet the Access to Cannabis for Medical Purposes Regulations that are included in the Controlled Drugs and Substances Act. While some edible regulations have just been released, there is still uncertainty as to whether they will eventually far surpass existing regulations for food and beverage products. Producers should expect regulations to be closer to pharmaceutical regulations than those for food and beverages. There are also regulatory challenges relative to the food service industry. Restaurants are nervous about losing business if customers stay home and consume cannabis rather than eating out where smoking is not allowed. Regulation will have to address whether restaurants can produce and/or serve edibles much as they can alcohol. Licensing and other requirements will have to be clarified. The current draft regulations place explicit restrictions on mixing alcohol and cannabis together as well as limits on caffeine. It is unclear what impact this will have on the restaurant industry. Finally, both consumers and producers of cannabis products should expect the market to evolve over the coming months and year. Changes in regulations, prices, product diversity, and social acceptance should be expected. These changes will create new opportunities, but may also threaten existing businesses. Bob’s Your Uncle is an advertising agency serving thoughtful food, beverage and lifestyle brands. In addition to working with leading consumer brands, they also have extensive experience shifting consumer behaviour, including Health Canada’s tobacco cessation strategy and Second Harvest Food Rescue’s efforts to reduce avoidable food waste. Bob's Your Uncle is an advertising agency for thoughtful food, beverage and lifestyle brands.